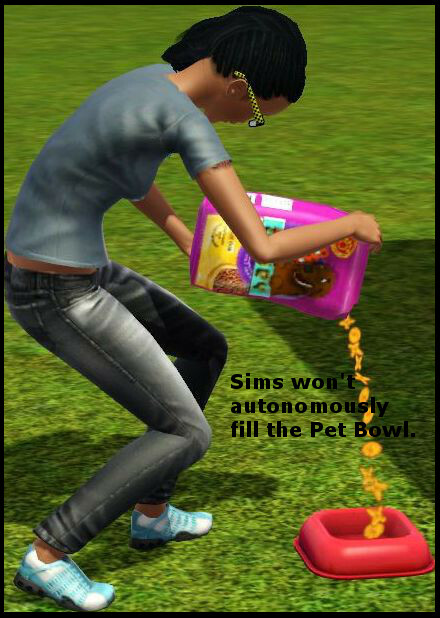 This mod prevents your sims from autonomously filling the pet bowl. Please remember to feed your pets yourself, or to use a self-filling/bottomless pet bowl, if you don't want your pets to be taken away by pet services. This mod was built with patch 1.50. This mod will conflict with claudiasharon's No autonomously fill pet bowl and pet bowl doesn't need to be filled! mod at MTS. Her mod is currently considered outdated. Please use only one. Additional Credits: This mod was originally created by claudiasharon at MTS. I only recently realized that it could use a minor update for Supernatural.